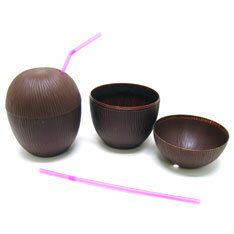 Perfect for place settings at Luau events, Pirates themed parties, South pacific themes or jungle settings. Coconuts snap together. Includes small straw. 4 inch diameter. 5 inches tall. Poly bagged. Sold by dozen. $9.05 per dozen for 16 dozen or more. $7.80 per dozen for 32 dozen or more.